You know I like to get consensus before I post a “best of” post on the Disney Food Blog, but every once in a while I have to be completely, utterly biased…and one of those times is now. Dessert is my thing. I love it. I look forward to it at the end of every meal in Disney World. I can’t get enough of it. And I’ll order it even when I’m not hungry just to take a few bites. As a result, I’ve tried quite a few of ’em, and want to share with you my very favorites. By the way, I’d love to hear your favorites as well. In fact, please do comment with your favorite dessert so I don’t feel quite so guilty about monopolizing this post with all of mine. I’ll admit this stuff looks boring. Get it out of the box, heat it up, put a bunch of sauces on it, and serve. But, friends, I gotta tell ya… it’s spectacular. Order one all for yourself. Tell your kids they can get Mickey bars outside. And, yes, when my husband and I go to WDW alone, we eat it right out of the serving dish. I used to dream about this dessert. Jiko’s filet with mac and cheese is fantastic, but it was this particular lemon-y blueberry sweet-tart span of flavors that kept bringing me back to Jiko so many times. Thanks for letting me be selfish and share my favorites — I can’t wait to read about yours! Torture. That’s what this post is made of. (Thank you). I feel your pain, Jerry. I feel your pain. Do Dole Whips count as dessert? Dole Whips can definitely be dessert. Or, in my case, breakfast. They don’t have the Lemon Curd dessert at Jiko any more?! What has this world come to?! Best Creme Brulee I’ve ever had: the tropical fruit creme brulee at Citricos! I haven’t tried any of these. Now I have a goal in life! Kelly – I know. Can you believe it?! I was so sad to find out. And I haven’t had the Citricos creme brulee — will have to sample next time! Have to say that I love the Baklava at Morocco in Epcot’s World Showcase! I’ve recently acquired an affinity for that as well, Amanda, thanks to the Baklava throw down during the F&W Festival! Yum! Those all look might danged scrumptious, but I’d have to say my personal favorite is Ger’s bread and butter pudding at Raglan Road. Now, *that’s* one I dream about! Jeff W — That’s a Chef Kevin Dundon original! If you check out our interview of Chef Dundon, the link for the Bread and Butter pudding recipe is at the bottom! I love the key lime pie at Coral Reef! I know this post was about dessert…but you said potatoes! How I MISS those Maui potatoes!!!!! I may have to make some this weekend. I love Ohana’s bread pudding!!!! That has to be my most favorite of all time! Anyone who has never enjoyed dinner at Ohana’s be warned…you MUST pace yourself and save room for the scrumptious dessert!!!!!! I can’t believe I have been depriving myself all these years. The most ‘dessert’ type thing I treat myself to is the fudge from the Main Street Confectionery and the caramel/chocolate apples. I will be eating dessert in WDW more often now. Thank you! Jill — I’m seriously considering a Key Lime Pie tour the next time I’m at WDW. 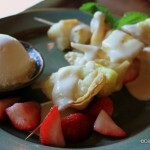 If you know of any other restaurants with great Key Lime desserts, let me know! Janna — I’m SO with you on that. In fact, here’s a blog post I wrote about the potatoes a few months ago. Those potatoes were incredible. 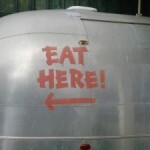 We usually told them to bring us two servings at the start! Patty — Woo! So glad you love that dessert, too! No kidding on the pacing yourself. That dessert is all-you-can-eat, so it’s only right to save a LOT of room! Allisonwonderland — First, cute name! Second, get out there and eat dessert! But, I have to admit, the fudge and caramel apples are pretty good desserts in and of themselves! Did you see the Disney World Fudge post we did a while back? 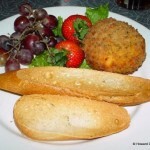 One of my favorite things is to goto France in Epcot and stop at the Boulangerie Patisserie. Anything they have is delicious! I love the bakery feel when you walk in and get to choose the delicious treat you are about to partake. Don’t get me started on the smell.. Pair that up with an espresso or cappuccino and you are set! Take your drink and dessert and go sit on the tables outside and talk and watch the people walk by. Just something we do on every Disney trip. My family loves the bread budding at Ohana’s. 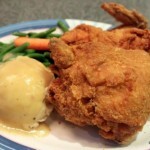 It is our favorite part of the meal there, and a prime reason for going back multiple times. My personal favorite would have to be the Chocolate Wave at the Coral Reef. I have a strong affinity for flourless chocolate cakes and the Chocolate Wave is one of my all time favorites. Chip, great point! Did you vote for the Boulangerie in the Bakery Throw Down? Jamie — I’ve never tried the Chocolate Wave, but have heard it spoken of very highly! I haven’t been to Coral Reef in ages, and might just need to make a stop over there. Different is good, Cody! Looking forward to trying Tutto sometime soon. Love the Bananas Foster at ‘Ohana! Want to try the Ooey Gooey Toffee Cake next time I go! Looks delicious! My daughter (7) says she wants to try the the toffee cake, too! She says it looks REALLY REALLY good (that is direct from her as she sits with me and looks at these mouthwatering pictures)! 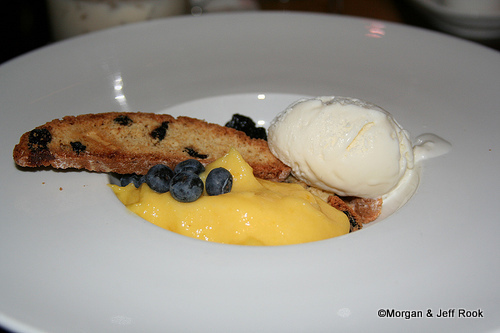 We love the Kilawea torte with a side of vanilla ice cream at Kona Cafe. Warm cookie crust you cut open to get a warm gush of chocolate ! Just had the strawberry cheesecake and creme brulee at Brown Derby- very yummy! I have to agree with the number one!, I schedule adrs just for lunch so I could have it, it was sooo worth waddling like a penguin afterwards! I dont like bread pudding to much but I love the bananas foster sauce! Nancy — the Kona dessert sounds amazing! I’ve never had it, but will have to make a trip next time. Thanks for the suggestion! Emily — We do too! We always make our first meal at LTT right when it opens for lunch. It’s a great way to start a Disney trip. Chip — Ha! Sometimes it probably does! Ohana’s dessert is our favorite dessert. We still eat at least two servings even after pigging out on all the meat Ohana’s serves. YUM…. Lillian — I’m starting to wonder if I just need to have them bring two bread puddings to our table! My favorite dessert was the toffee creme brulee at Cinderella’s royal table. Thanks for your suggestion, Colin! I haven’t tried it yet! Try the dessert sampler for two at Grand Floridian cafe. Does anyone know where I can find a sour apple smoothie at WDW? I had one at Coral Reef but can’t find one any where else. My favorite has always been the Tie Dyed cheesecake. Bob — You can find the Sour Apple Smoothie at Le Cellier as well, I believe! 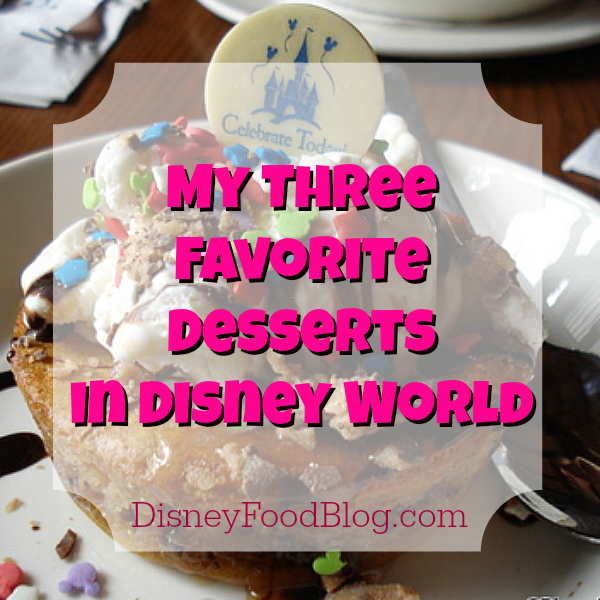 On our most recent trip we were on the dining plan so there was no shortage of desserts! We sampled some wonderful desserts (and some that were just so-so), but my favorite dessert on this trip was found on the dessert buffet at Boma. Banana bread pudding. It’s bread pudding, made with banana bread, and is served with vanilla bean sauce on the side. OMG—seriously delicious! I was sooooo full, but kept going back for more because of how good it was. I was almost painfully full when my family and I rolled out the door, but it was worth it! I really enjoyed the Chai Cream at Sanaa. It was a great way to end a great meal! I love the sticky toffee pudding at the Rose and Crown, the bread and butter pudding at Raglan Road, and the grapefruit cake at the Brown Derby. Yum! When I go to Epcot, I always get the rice pudding with strawberries, from the Norway bakery, it’s so good!! That and the milkshakes at the Prime Time Cafe are the best. I am so late to this conversation, but wanted to add that my favorite dessert to date at the World (and possibly the rest of the world) is the berry cobbler at Artist Point. Simple and unbelievable. The maple creme brulee from Le Cellier is right up there too. I am also late to this converation. But I think I’d have to include the Zebra Domes at Boma. My overall favorite dessert is Ohana’s bananas foster bread pudding. It’s worth it to skip most of the rest of the meal and double or triple up on this dessert. In fact, if I could find this dessert elsewhere, I’d make it a point to eat there just for dessert. I also enjoyed the Sticky Toffee Pudding at the Rose and Crown, the duo of creme brulee at Narcoosee’s, the Capirotada de Chocolate Blanco at San Angel Inn, and the Chocolate Indulgence at Artist Point. I found the grapefruit cake at the Brown Derby to be hugely disappointing. I’ve made grapefruit cake myself, and found the Brown Derby’s version to be bland and a little dry in comparison. Sadly, one of my favorite desserts, the Whiskey cake formerly served at Rose and Crown (or was it Le Cellier?) is gone. And the last time I went to Narcossee’s, the creme brulee duo wasn’t on the menu. Although this item was offered at breakfast this morning at Boma at Animal Kingdom Lodge, I feel it is more of a dessert: french toast bread pudding (think very light cinnamon and raisins) with Bananas Foster Sauce! I am not sure just when this was added to the Boma breakfast menu, but it was NOT there back in February. 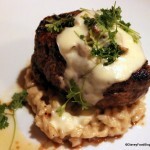 Craig- it was Le Cellier and I SO agree! The whiskey cake was one of my first WDW desserts ever… I really miss it! Every visit, I have to get profiteroles from Le Chefs de France and Narcoossee’s sugar-almond crusted cheesecake. We also get the fruit tarts from Starring Rolls. Judy- you made my day as I didn’t realize that you could get the rice cream anywhere but Akershus! I know where I’m going in August. Thanks! When I go to Disney in October, I want to try the Kitchen Sink 😀 It has 12 flavors, all the toppings in the restaurant, and TWO whole cans of whipped cream!!! Have you ever had it?